The age-old question: Who do you want to be when you grow up? Engaging with peers and adult mentors is a huge help when deciding your next steps after graduation. 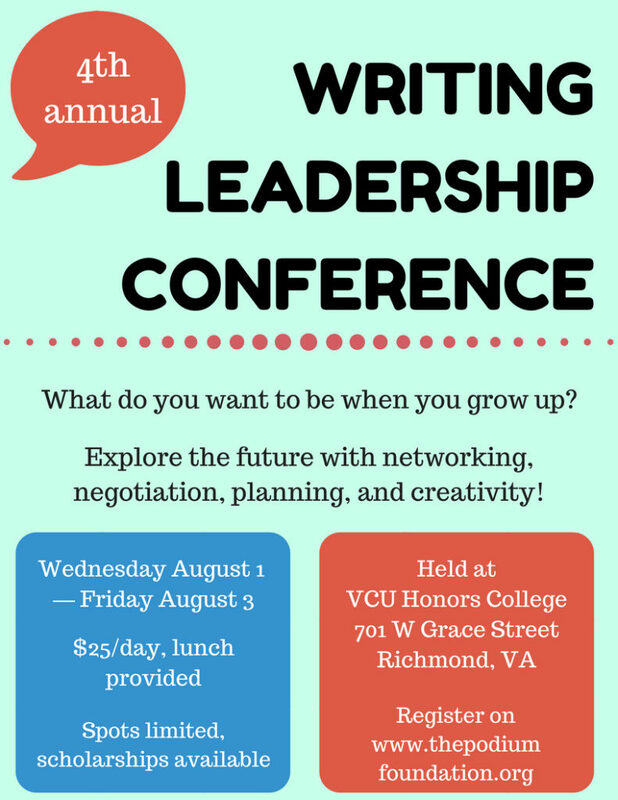 WLC is a 3-day program for teens to collaborate on advanced writing projects, developing their professional selves, and interacting with diverse professionals. Connect your passion and skills with future academic and career options and meet other teen writers across the region! Join us for our 4th annual leadership conference! Youth are expected to attend all three days of the conference. There is a $25 fee per day, or a $75 total conference fee that helps cover the cost of activities and meals for each day. If you cannot afford the full fee, please check the scholarship box on your conference application. Youth will be provided with snacks and lunch. Please make note of any restrictions or allergies in the conference application. Youth will need to have their own transportation to and from the conference each day. We will begin and end each day at the VCU Honors College, located at 701 W Grace St, Richmond, VA 23220. Please meet in the main lobby, where staff will be waiting to greet you!